The game at Kenilworth Road is sold out, meaning over 10,000 will pack themselves into the stadium in the hope that the hosts will continue their superb unbeaten run. Luton are currently 16 league matches without defeat, while they haven't lost in front of their own fans all season in the league either, as Harford said: "Result wise, that’s the most important thing for us as a staff and a group of players, but we will be aided by a full house, by a magnificent set of supporters, who will 100 per cent get behind the team and that will give us a massive advantage. "I can’t ask any more of the Luton fans in all fairness, they’re an absolute credit to themselves and a credit to the football club. "The way they get behind me personally, the way they get behind the staff, the way they get behind the players, it’s just phenomenal. "I know without even asking them that they’ll be behind the players." 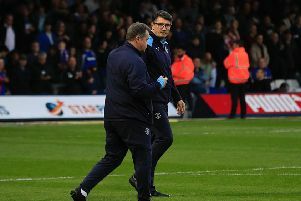 Although Luton are now two points clear of their opponents going into the game, Harford didn't expect to change his side's winning philosophy going into the contest. He added: "I can’t wait to be honest with you. "It’s something we always look forward to, Tuesday night, down at Kenilworth Road, full house, the team playing well, performances going all right and we’re top of the league. "It’s a real, massive key game, if we can get something out of that game, ie victory, we just open up a little gap. "So we’ll be positive, and will set out a team that will try and win the game."